The Awesome Awards Turn Two! The Awesome Awards Turn One! The Awesome Awards are powered by your love. Your love of nature, your love of family and friends, your love of community, and even moreso, your love for fellow people and the human spirit! Recognition is powerful because it is intentional positive energy. Recognizing someone through an Awesome Award nomination takes your positive thoughts and energy and turns them into an enduring symbol of gratitude and appreciation. Your nomination will always exist, so it's a powerful way to show someone some love! The same can be said for paying forward an Awesome Award. By taking time to recognize and celebrate the people and qualities we value, we strengthen relationships and cultivate communities. We want great things to happen whenever someone is recognized in The Awesome Awards, so to add even more awesome, we've partnered with the good people at Eden Reforestation Projects. We love their awesome mission: to create healthy forest systems that restore hope, alleviate suffering, empower people, and build local economies in impoverished communities. Furthermore, as one of the world’s premier reforesters, Eden will ensure that the trees are planted, protected, and grown to maturity. Now, with every Awesome Awards nomination, 5 trees will be planted to celebrate your nominee. 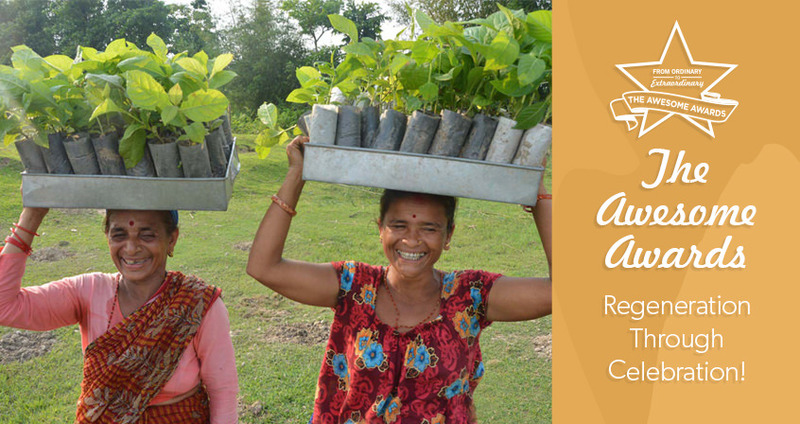 And for every story shared of an Awesome Award being paid forward, 10 trees will be planted in your honour! To celebrate the launch our partnership with Eden, we’ve committed to planting 2500 trees throughout Nepal, Madagascar, Ethiopia and Haiti! These trees will help regenerate the environment by improving biodiversity, sequestering carbon, providing food (agroforestry), cleaning the air, preventing soil degradation, and creating jobs! Eden works with local folks to plant native trees and every 100 trees planted creates a day of work - so making a nomination will also help create employment and lift people from extreme poverty. With every nomination and award paid forward, The Awesome Awards help build communities and make people happy. Now, they also help regenerate the environment! Join us in celebrating the human spirit and regenerating the planet! Nominate someone you admire and respect for an Awesome Award - it’s simple, free, and we’ll plant 5 trees in celebration! know what is happening with these Awesome Awards! Powered by Eclipse Awards | © 2013 Eclipse Awards Ltd.